Mumbai-based Sachar Gaming Pvt. Ltd. has announced that it would be shutting down operations of its poker website Khelplay.com by 15th March, 2018 as part of a ‘business restructuring process’. 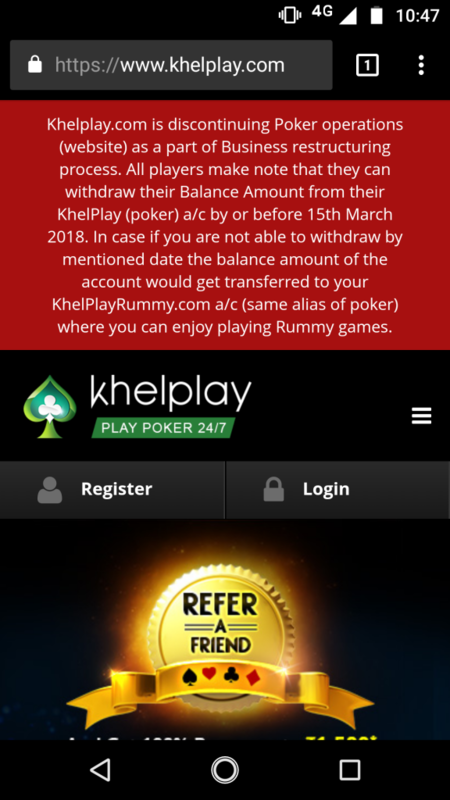 The company through an announcement made on the Khelplay website stated that players can withdraw their balance amount on or before 15th March, after which the amount would be transferred to their Khelplayrummy account. It is understood that while Sachar Gaming would be shutting down their poker operations, they would continue operating their rummy brand, Khelplayrummy. The reasons for shutting down the website are not immediately clear and Sachar Gaming’s representatives did not respond to Glaws’ request for comments. It is however understood that the reason for the closure of the website is the company’s failure to attract players in an increasingly competitive market. Khelplay, which is connected to lottery conglomerate Sugal & Damani Group and has a license from the Nagaland government to operate online skill games, was part of International software provider Microgaming’s India Poker Network (IPN), which also had Essel Group’s Pokernation and Lucknow-based Club Empire Tech’s Pokeryaar. Industry observers indicate that Microgaming’s India platform has failed miserably in building any substantial player pool, getting liquidity or traction in India. With only Pokernation and Pokeryaar now left in IPN, it seems that Microgaming’s India experiment is likely to fail.